Strong, light and durable - this easy to use back support provides outstanding support and comfort. It's unique web design gives the ultimate in SUSPENSION BACK SUPPORT! 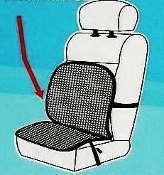 Also, ensures maximum ventilation, for Leather Seats, etc.TRY IT YOU WILL LOVE IT, SAVE YOUR BACK!! Buy one now, we'll send you a second one FREE!